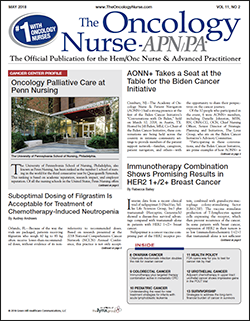 The May issue of The Oncology Nurse-APN/PA (TON) is full of important news and updates for oncology nurses. In this issue, we feature a profile of the University of Pennsylvania School of Nursing in Philadelphia, and speak with Salimah H. Meghani, PhD, MBE, RN, FAAN, Associate Professor and Term Chair of Palliative Care; Associate Director of the NewCourtland Center for Transitions and Health; and Chair of the Graduate Group in Nursing, University of Pennsylvania School of Nursing, about her various roles in academia, research, teaching, mentoring, and service. In an interview with TON, she discussed her ongoing efforts to improve the uptake of early palliative care communication between the clinician, the patient, and their family (view here). “Palliative care communication frequently occurs too late. Burdens to patients and their families and overtreatment can be prevented if clinicians engage the patient and family about prognosis early on. My research focuses on why there are delays in communication about prognosis and what can be done about it,” said Dr Meghani. Other valuable insights that can be gleaned from articles in this issue include the potential for a novel immunotherapy combination regimen of nelipepimut-S plus trastuzumab to extend disease-free survival in patients with HER2 1+/2+ breast cancer (view here); the need for solutions to accelerate progress in cancer prevention, detection, diagnosis, research, and care, and to reduce disparities in cancer outcomes, as discussed at the first of the Biden Cancer Initiative’s “Conversations with Dr Biden,” held on March 10, 2018, in Austin, TX (view here); and findings from a recent analysis indicating that suboptimal dosing of filgrastim can be acceptable for the treatment of patients with chemotherapy-induced neutropenia and leads to cost-savings (view here). “Our analysis showed that for patients weighing up to 85 kg, it’s okay to give the ‘suboptimal’ dose….It’s ok to use one vial. But for patients over 85 kg, you should optimally dose,” said Ahmed Elsayed, MD, MS, Hematology/Oncology, Joan C. Edwards School of Medicine, Edwards Comprehensive Cancer Center, Marshall University, Huntington, WV. We also feature an update on the challenges of treating infant acute lymphoblastic leukemia (ALL), a disease associated with poor prognosis and low survival rates (view here). “Infant ALL is very different from childhood ALL with regard to genetics and response to chemotherapies; standard ALL therapy is not sufficient, and more intensive therapy is needed,” said Paige Johnson, DNP, CPNP, CPHON, Pediatric Nurse Practitioner, Children’s Mercy Hospital, Kansas City, MO. This issue also includes key presentations and studies from recent national and international meetings, including the 2018 National Comprehensive Cancer Network Annual Conference, the 2018 Genitourinary Cancers Symposium, the 2018 American Association for Cancer Research Annual Meeting, the 2018 Cancer Survivorship Symposium, and the 2018 Gastrointestinal Cancers Symposium. At the 2018 Cancer Survivorship Symposium, researchers discussed the findings of a study showing that only approximately 11% of cancer survivors reported frequent fear of cancer recurrence, and that this fear was not linked to severe mental disorders or depression, but rather to “rational” or “expectable” indicators of worry (view here). “I think these findings build on some of the literature suggesting that [fear of cancer recurrence] is distinct from depression and distress,” said Sarah C. Reed, MPH, MSW, PhD, Assistant Professor, Jane Addams College of Social Work, University of Illinois at Chicago, who presented the results of the study.